This Set Collection has a modern feel and look. The finish is a high gloss Walnut finish. 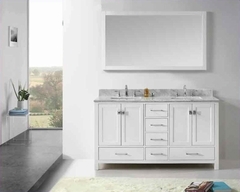 The Collection brings the modern crisp look and feel with simple chrome finish pulls and legs. The collection gives the room a rich, clean look and an open airy feel. The Bedroom Set consists of Queen Size Bed, Nightstand, Dresser and Mirror. The Bed is available in Queen and King Sizes. 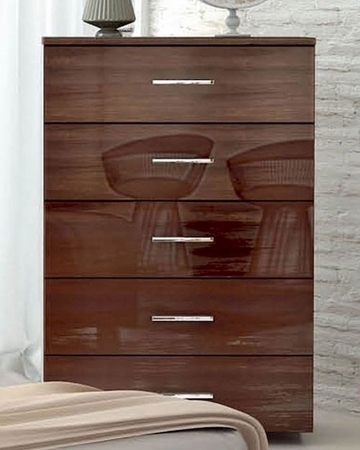 The 5-Drawer Chest is an optional items. Straight panels are in chipboard, then veneered (veneer being a thin layer of solid wood); then the veneers are lacquered using a 6 steps/layers of UV high gloss polyester lacquer. Manufactured according to European and international standards. Made in Italy. Box Spring or mattress over 12 inches is required.